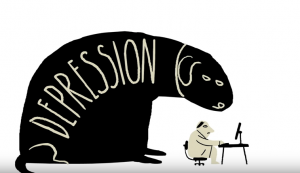 Described as the black dog, dark cloud, black hole or endless pit – depression is often depicted as an all-consuming emotional state that is unyielding to the sufferer. A term bandied around by many, depression often accompanies judgement, stigma and shame rather than understanding, compassion and support. Depression is likely to touch most of us directly or indirectly but it is often hidden under a shroud of mystery leaving people unclear on what depression is. Identifying signs of clinical depression versus normal sadness or low mood is crucial to help steer individuals towards the right support. 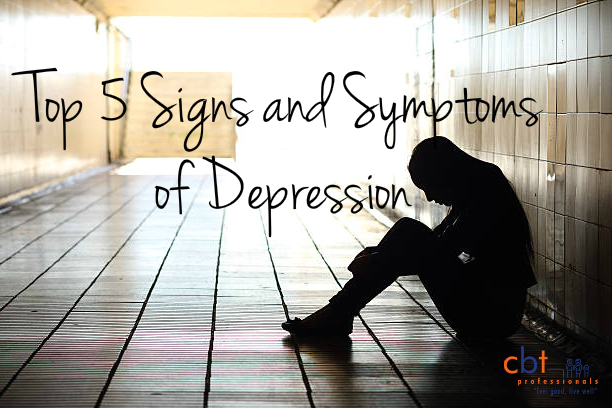 This article will outline the top 5 signs and symptoms of depression. Mood – Feeling very low, down, flat and depressed most of the time – more days than not is symptomatic of Major Depression or clinical depression. Other emotions include guilt, shame, agitation and restlessness. This is not something the sufferer can just shake off or snap out of by thinking positively and refocusing,rather,this state feels overwhelming and uncontrollable leaving them lost, empty, helpless and powerless. Motivation – Feeling fatigued and low in energy and motivation isa common sign of Major Depression. Loss of interest in activities once enjoyed can leave individuals with depression socially isolated after disengaging from hobbies, clubs and sports. It’s a vicious cycle as low activity and under-stimulation createsthe perfect environment for depression to thrive. Over-thinking and negativity– reliving past events, pessimistic thinking, over-analysing life and worrying about the future torments the mind of those with Major Depression. Rigid and inflexible thinking is also characteristic of a depressed mind. Other symptoms of depression like over- or under-sleeping, increase or loss of appetite, poor concentration, planning, organisation and problem solving skills leave individuals having less and less ability to function at home, work and in relationships causing secondary issues in these important life domains. Despair – Prolonged symptoms of depression can result in the sufferer losing hope about the future. Thoughts like ‘will I ever be the same’, ‘I’m trapped and can see no way out’, ‘I’m a burden to my family’ and ‘they’d be better off without me’ can lead to risk of suicide in severe cases of Major Depression. If you or someone you know can relate to any of these signs of depression it is important to seek a professional assessment and treatment with a psychologist. You can read more about types of treatments available for depression here. For more information on how to help yourself with depression, you can download our free Self-Help Guide for Depression here.